Roundtrip economy class air transportation from New Orleans to New York LaGuardia Airport, Leave New Orleans 6:05a arriving 9:55a; return departure is at 5:00p arriving New Orleans 7:46p. Roundtrip private coach transfers from the airport to/from the hotel. Baggage handling at the airport is not included. Porterage of luggage at the hotel and storage as required. One checked piece per person and one carry-on bag allowed. 4 Nights’ accommodations at the Paramount New York in the category of room selected. Complete itinerary and information on New York City and map of city. Daily Breakfast at The Paramount. All current taxes, government fees, occupancy tax and fuel surcharges. Taxes related to air transportation and fuel surcharges are not guaranteed until full payment has been received. Please note that the per person package cost will be adjusted should the group tally of 30 participants not be met. Pricing is valid until September 30, 2015. Pricing will be based on availability after September 30, 2015 and subject to change. 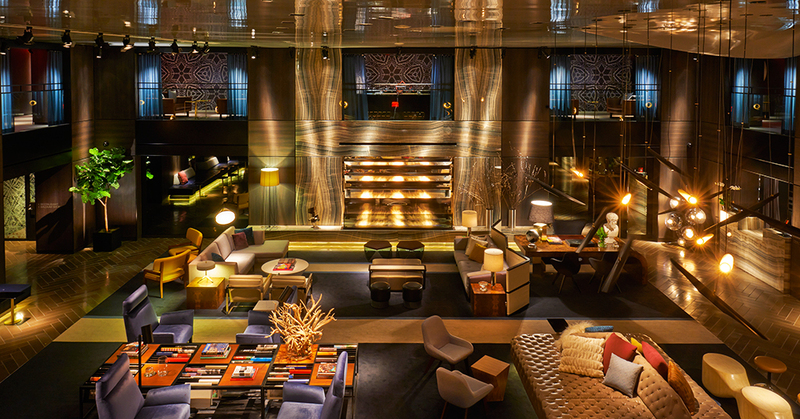 The bustle of the street disappears as you step inside the Paramount Hotel. The chic, two-story lobby, with its reflective fireplace, dramatic lighting, and rich textures, sets the stage for a hip, indulgent experience. While you are a guest of the Paramount you will enjoy a stylish, comfortable, and centrally located home base for all of your adventures in New York City. Recently updated but retaining its historical charm, the Paramount is the only Times Square hotel with genuine personality. The Paramount is located on West 46th Street steps from Times Square and Restaurant Row. A deposit of $150.00 per person will confirm your reservation. The deposit is non-refundable. You can pay the deposit by check or credit card. Preferred method of payment is by check payable to Frosch Travel. Should you wish to pay by credit card that is possible for an additional 4% fee. Final payment will be due on or before Monday, February 1, 2016. Prices are subject to change until all components are confirmed. Destinations Travel Advisors and Frosch Travel reserve the right to correct any pricing and printing errors. Taxes and fuel surcharges are not guaranteed until full payment is made. Air schedule is subject to change. Please review the Terms & Conditions found on Destinations Travel Advisors web-site. Please complete the registration form below to submit your information to Destinations Travel Advisors. Please provide your full legal name as it appears on your driver's license or government issued photo I.D. Please enter your 10-digit telephone number. If you have a frequent flyer number with Delta Air Lines, please enter it here and we will be sure to add it to your air reservation to receive mileage credit for your flights. Please indicate the number of people in your room and desired bed configuration, including yourself. Should you wish to pay by credit card, you will incur a 4% processing fee in addition to the payment. If you are paying by credit card, please provide the last 4-digits of your card number and the expiration date below. We will call you to collect the full details. Please note that the $150 per person deposit is non-refundable. Final payment is due on or before Monday, February 1, 2016. If there will be more than one guest in the room, please provide their legal name, contact phone number, email address, date of birth and gender. Please provide you full legal name as it appears on your driver's licence or government issued photo I.D. Please provide your full legal name as it appears on your driver's license and government issued photo I.D. Please advise any special requests you may have. I hereby acknowledge that the $150 deposit is non-refundable should I cancel or decide not to participate.